How can trees affect my power? Trees can affect service reliability and interrupt power to customers. In a worst-case scenario, a tree can tear down the entire line and break the poles. 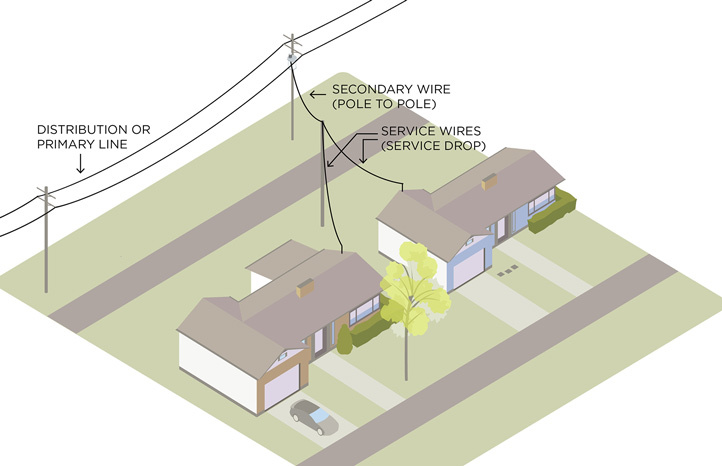 However, a tree or even a limb can fall across two of the wires on the pole and create a path for electricity flow. When this happens, protective equipment usually shuts off the line. High growing bushes, vines and trees may cause electrical blinks and flickers. Are there safety issues surrounding trees and power lines? Trees and tree limbs can tear down power lines. When trees grow close to or into the lines, someone climbing a tree could contact an energized line. Serious injuries or death may occur if a person touches energized power lines. Most lines are not insulated; they are bare wires. My trees haven't caused any power outages. Why are you pruning or removing them? Idaho Power proactively maintains power lines, before trees and brush are close enough to cause outages. If we wait until trees and brush actually cause outages, we’ve failed to provide customers safe, reliable power. What if there’s a problem with a tree affecting the service wire that runs from the power pole to my house? Pruning trees away from a service wire is not part of our routine line clearing maintenance. However, if requested by a homeowner, an Idaho Power representative will investigate and prune if necessary. If a branch is determined to be a problem, Idaho Power will de-energize the power line during normal business hours at no charge so the customer can make the necessary prunes. Our policy is to chip any small limbs, branches and brush from landscaped settings. Idaho Power will haul this material away or leave the mulch with the property owner at their request. Any wood larger than four inches in diameter is cut into manageable lengths for the property owner. Dead wood cannot be chipped and will be left on the property. Will I be notified before a tree crew comes to clear lines in my yard or neighborhood? We leave door hangers on each customer’s door before crews arrive for routine maintenance work scheduled for the area. We are unable to provide prior notification in emergency situations. Most professionals recommend extensive pruning in the dormant season (during winter when trees don’t grow). Minor pruning can occur any time of year. When and how often does Idaho Power clear lines in my area? We employ a systematic approach to maintaining our more than 20,000 miles of overhead power lines. Depending on the conditions on a given line, our maintenance cycle is about every three years. Each tree is different and must be considered individually. Trees with trunks close to the power lines require much heavier pruning than trees located farther from the line. Some techniques that are appropriate on hardwood trees cannot be used on some softwood species. When pruning, our experts make every attempt to provide sufficient clearance for the tree to remain safe until the next routine maintenance (roughly every three years). Does Idaho Power “round” or “shape” trees? We do not “round” trees over because it’s not good for the health of the trees. We follow the ANSI A300 tree pruning standard and use a method of pruning called directional pruning. This method is endorsed by many in the tree-care industry as being the best technique for the health of the tree. Directional pruning removes each limb where it joins another limb or at the trunk. This procedure is different from “rounding” trees over, where limbs are cut at random points, normally leaving unhealthy “stub” cuts. Directional pruning involves cutting a limb back to another limb so future growth is directed away from power lines. With the directional technique, tree growth causes minimal impact to public safety and electric service. Are the line clearers trained professionals? Yes. Each crew has at least one certified arborist or person who has completed an advance course in arboricultural training. The area supervisors, Idaho Power utility arborists and staff notifying customers in advance about the line clearing project are all certified arborists. Is there a charge for line clearing on my property? 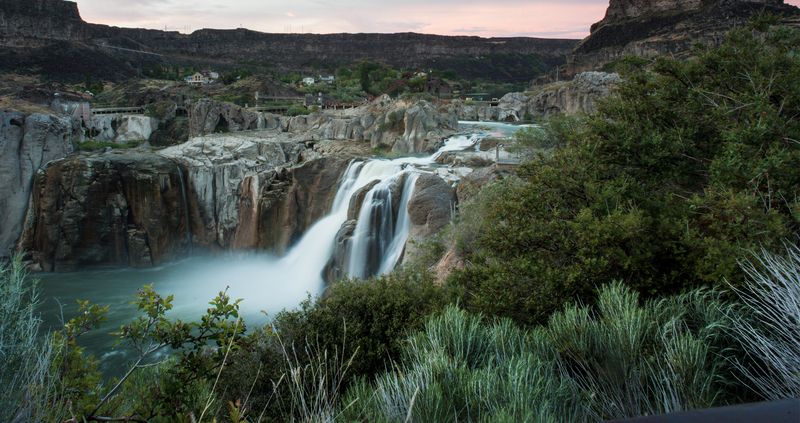 The cost of managing the natural growth around power lines is part of the rates approved by the public utility commissions in both Idaho and Oregon. Can I clear the lines myself? Pruning trees around power lines should be done by trained professionals only. Serious injuries and even fatalities have occurred when untrained individuals do this work themselves. Please contact us online or call us at 208-388-2323 from the Treasure Valley area or 1-800-488-6151 for an evaluation of the trees and vegetation around power lines prior to any removals. 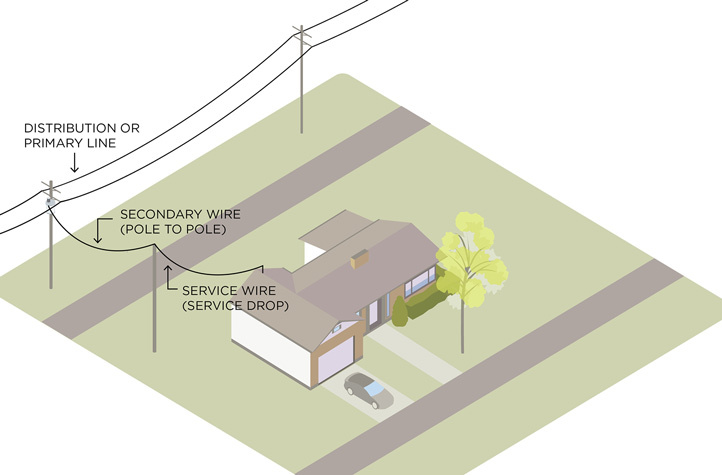 What types of trees and/or plants should be planted near transformers and power lines? If vegetation is needed under power lines, Class I trees with a mature height of less than 25 feet are best. Is Idaho Power responsible for clean-up after line clearing? In non-landscaped sites, pruned vegetation and wood is left in place to biodegrade. When severe weather causes trees or other vegetation to fall across power lines, creating power outages, we cut the trees and brush so poles and lines can be replaced and re-energized. Disposal of any wood, limbs or debris resulting from this type of emergency operation is the property owner’s responsibility. Do you need my permission to clear lines on my property? Idaho Power has easements to the property that allow us to maintain our lines. While we do not need permission to prune, we do like to notify our customers when access to their trees or property is necessary for the safety and reliability of our power lines. What happens if I refuse access to my property/tree? Idaho Power is obligated to keep lines clear to provide power to the community and our customers. We can, as a last resort, pursue legal means. Do I need to be present when line clearing is performed? No, unless needed to unlock a gate or control pets. Can I have my own tree pruning service do the job rather than Idaho Power? No, because only specifically trained professionals can work within 10 feet of a power line, and many tree pruning companies don’t have such professionals on staff. Idaho Power clears lines at no cost to the customer, and we try to make it as convenient as possible. Do you repair cuts made from pruning? No. Repairing cuts has been found to be ineffective for slowing growth or preventing disease. Can mulch or chips from the pruning be left with the owner? Yes, at the customer’s request; however, the chips are not sterilized and may include thorns, branches and pesticides. Do you clear branches away from telecommunication and cable TV lines? No. It is the responsibility of the phone and cable utilities to prune trees or vegetation around their lines. What happens if my tree dies after pruning? If it is clear that pruning killed the tree, Idaho Power will cut it to a stump and provide the customer a voucher to replace the tree. Why don't you relocate your overhead lines to underground? Idaho Power usually installs power lines above ground (also called overhead lines). This is the most cost-effective option. Installing power lines underground is usually cost prohibitive for customers, but Idaho Power is willing to relocate overhead lines to underground if a customer is willing to pay the cost. Contact Idaho Power for a price estimate.